Taking another puzzle from Alok Mittal’s class – another beautiful puzzle! Six players – call them A, B, C, D, E and F – all around a circular table divided into six equal parts. At the centre of the table is a disk mounted on a central pin around which it can rotate. The disk is marked with arrows and digits. The wheel is spun 5 times. After each spin each player scores the number of points within his/ her segment of the table. 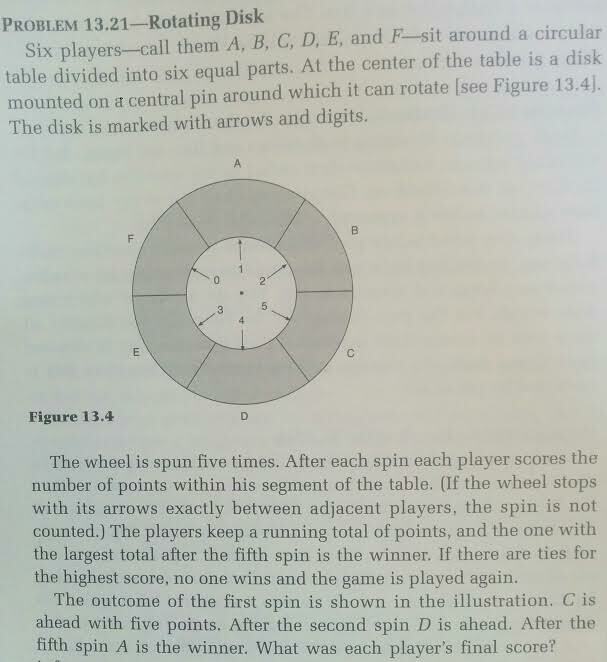 If the wheel stops with its arrows exactly between adjacent players, the spin is not account and hence repeated. The players keep a running total of points, and the one with the largest total after the 5th spin is the winner. If there are ties of the highest score, no one wins and the game is played again. The outcome of the first spin is shown in the illustration. C is ahead with 5 points. After the 2nd spin, D is ahead. After the 5th spin, A is the winner. What was each player’s final score.